What has always been especially disturbing to us about the circumstances of the Rechnitz Massacre is that its victims were Hungarians, and that yet the Thyssens, from whose castle the massacre was launched, had relied not just once, but twice on an adopted Hungarian nationality of Heinrich Thyssen-Bornemisza for the post-war salvation of their German fortune. A fortune that has allowed the Thyssens to retain an iron grip on their public image. And a fortune from which Sacha Batthyany too has profited. It is perhaps unsurprising, then, that the Hungarian reaction to Sacha Batthyany’s book is somewhat more critical than that seen in Western Europe. „Andreas Lehner of Refugius says his organisation will not stop until the graves of the victims have been found and the victims can receive a dignified burial……..(Many developments for the better have taken place in Rechnitz).….In the past, the people of Rechnitz have been suspicious of outsiders. The turning point came with the English author David R. L. Litchfield and his 2007 book „The Thyssen Art Macabre“. It is full of facts about the history of the Thyssens which show disturbing parallels to the Rechnitz story. It put a spotlight on this family which was unheard of before in Austria in this way. The book contains interviews with many witnesses……….The English author also rejected the old story of the Russians burning down the Rechnitz castle and instead stressed that the much more likely turn of events was a burning down by the retreating Germans in order to extinguish incriminating evidence…….. The Sovjets found the graves of the Jewish victims very quickly. 21 graves with 10-12 bodies in each grave. The victims showed signs of torture. A second exhumation took place in the context of the 1946 court procedings. But then the area map was lodged with the local public prosecutor whereupon it mysteriously disappeared. Andreas Lehner of Refugius says that the Sovjets were only interested in the graves of their own fallen soldiers. The graves of the Jewish victims were irrelevant to them. Of course, this is no explanation for why the map lodged with the Austrian authorities vanished. Perhaps it was taken back to Russia together with thousands of documents when the Russian occupiers left Austria in 1955. There are reports now of a serious new attempt by Austrian historians to put a group together to search the Russian archives to find this map. It will be very difficult of course to find this single document amongst what must be millions of files……..
Technical methods of excavation are getting more and more sophisticated all the time……Of course it would have been much more convenient to have been told the location of the graves by those who knew. But Margit Batthyany-Thyssen and her husband Count Ivan Batthyany fled Rechnitz in advance of the approaching Red Army. (Equally so Franz Podezin and Joachim Oldenburg)……….Following the Sovjet withdrawal, they came back to Rechnitz where they engaged in hunting……When they died in 1985 and 1989 respectively, the Batthyany family living near Güssing refused permission for them to be buried in the family crypt…….. The mayor of Rechnitz, Engelbert Kenyeri, says that the events of the Rechnitz massacre unfortunately add a negative aspect to the otherwise unblemished history of the Austro-Hungarian Batthyany dynasty and that this is particularly unfortunate, as they were only really involved through Ivan Batthyany’s marriage to Heinrich Thyssen-Bornemisza’s daughter Margit……….Josef Hotwagner, the town historian, who died a few years ago, had lived through the period in question in Rechnitz and had also over the years spoken to many local people with information….. And today there is for instance Andrea Hütler, a teacher at the local high school, who studies the events with her 14-year-old pupils and organised a project that won the Fred Sinowatz award“……..
(the pupils also went to Budapest and met with Gabor Vadasz, son of Geza Vadasz and nephew of Arpad Vadasz, who were both murdered in Rechnitz. Gabor has for years desperately attempted everything in order to facilitate the finding of the graves. 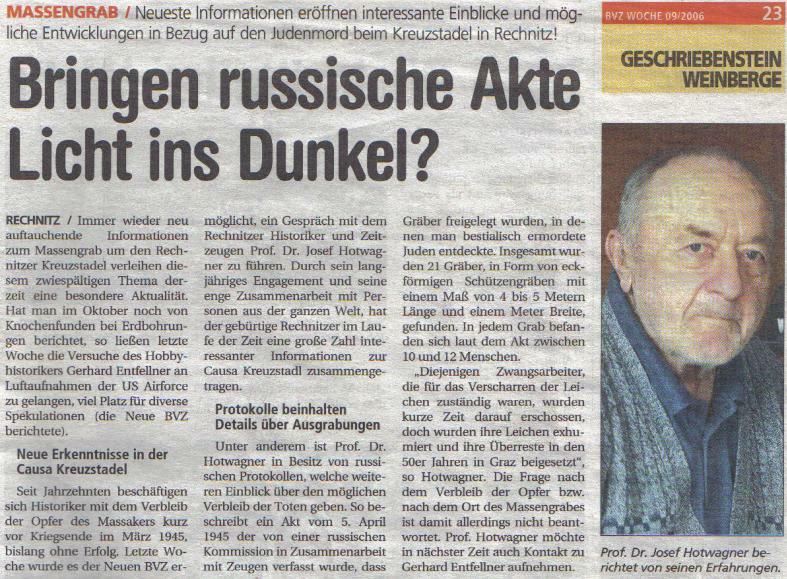 According to an article by Judith Gergaly, he has even written to high-ranking Austrian politicians and to the Pope). We are reassured by the Hungarian reaction and validation of our work (and particularly by the article of Julia Szaszi, who is also Vienna correspondent for the big Hungarian daily newspaper Nepszabadsag) and hope that the writings of the Hungarian commentators will engender many positive new outcomes in this sad matter. 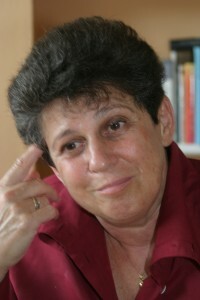 So, should Sacha Batthyany, whose book, seven years later, contains no new information on the Rechnitz case whatsoever compared to his 2009 newspaper article (in fact less, since, for some reason, he has taken out the evidence concerning Margit Batthyany-Thyssen’s protection of the two main perpetrators, Franz Podezin and Joachim Oldenburg!) and instead takes attention away from the Rechnitz case and onto an entirely different story, perhaps interrupt his busy lecturing tour and concentrate on this rather more difficult endeavour? He could certainly salvage his family’s name much more impressively if he did that than if he continued to promote his self-righteous book which even he admits to being somewhat fictional. Unfortunately, jugding by the article by Ficsor Benedek in Magyar Nemzet, Sacha Batthyany now seems to have started rebranding himself as a victim of the Thyssens’ behaviour rather than accepting his own family’s guilt. This is now an ideal, historical chance for the Thyssens to publicly accept their guilt and to get involved in the resolution of the Rechnitz case in order to heal the wounds of the tremendous harm done to the Hungarian victims and their families, as well as to the people of Rechnitz. Julia Szaszi, former Vienna correspondent for the big hungarian daily newspaper Nepszabadsag, led interviews in Rechnitz and has reported several times on the Rechnitz case in the hungarian media. On the internet platform Szervuszausztria.hu she reports in hungarian on all matters austrian.